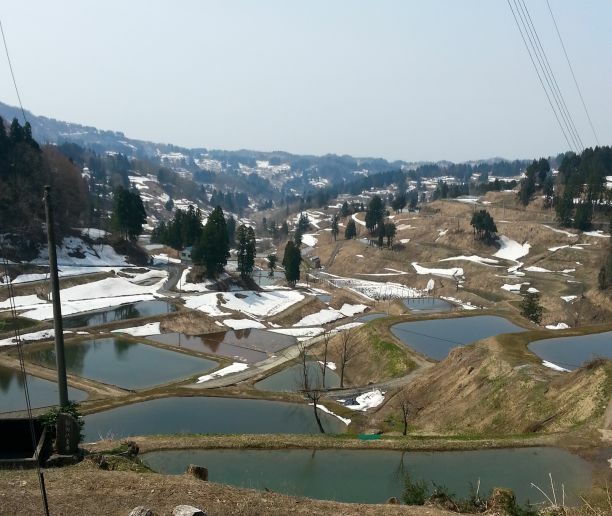 The first Koi Hunting trip for 2016 was made middle March and this year's purchase of Tosai (one-year old) is expected to arrive early April. As usual after the necessary quarantine procedures they are then ready for selection and purchase. Nice Tosai Kohaku and Tancho are a 'must view' and purchase for this shipment. Over the last 2 years during koi hunting trips I noticed a gold fish named Tamasaba. Not many breeders are breeding such gold fish. During this trip I managed to visit about 6 of these breeders to get some understanding of such gold fish and decided to bring them in. My 1st time. Tamasaba gold fish's body is round like a ball (ball is Tama in Japanese) and they have deep red color even without being fed with color food. 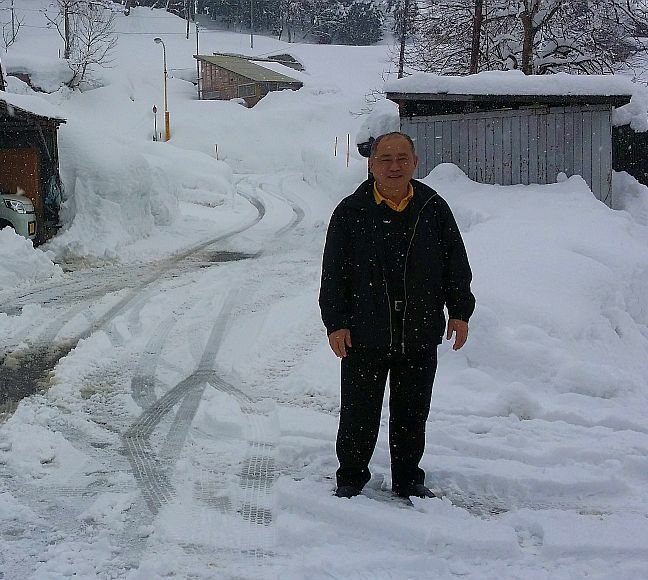 In Japan due to the cold weather they grow much slower than in tropical countries like Malaysia. They can be kept in ponds or even aquarium tanks and live well with koi in the same pond. They are fearless and are very fast to rush for food during feeding time. As for speed they are even a lot faster than koi. As a result over time they become leaders in the pond.... as good a leader as Chagoi! They are really cute and well liked by koi keepers. It is said that they bring lots of luck to their owners! New Year 2015 celebration for the Japanese just over. I visited Niigata to select Tosai (one-year old), and some 2-year old with snow falling heavily throughout the 6 days I was there. 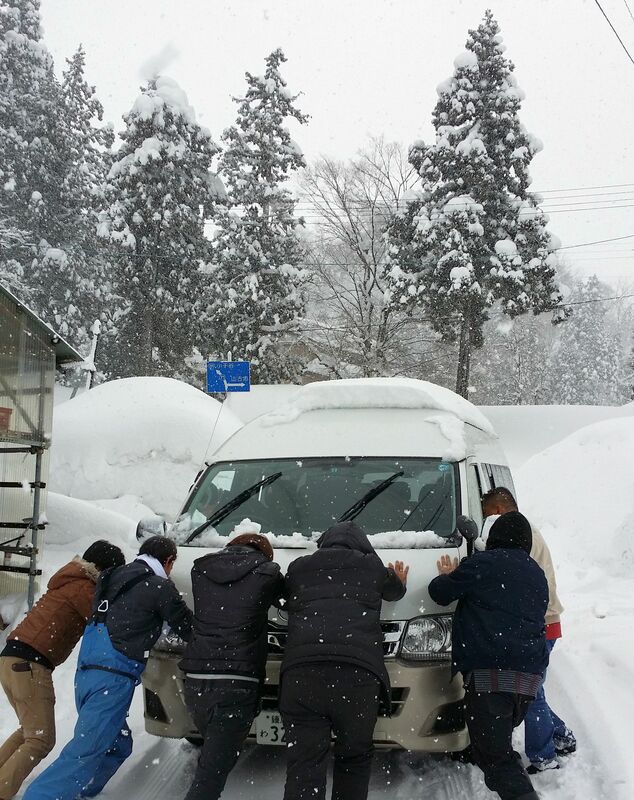 It was quite an experience having snow falling almost the whole day and night and the almost all-white surroundings in the Niigata area. Koi buying trip this time was made a lot harder given the weather factor. When these koi eventually got shipped in and purchased by delighted customers of Kohaku Koi House it is most satisfying for me. 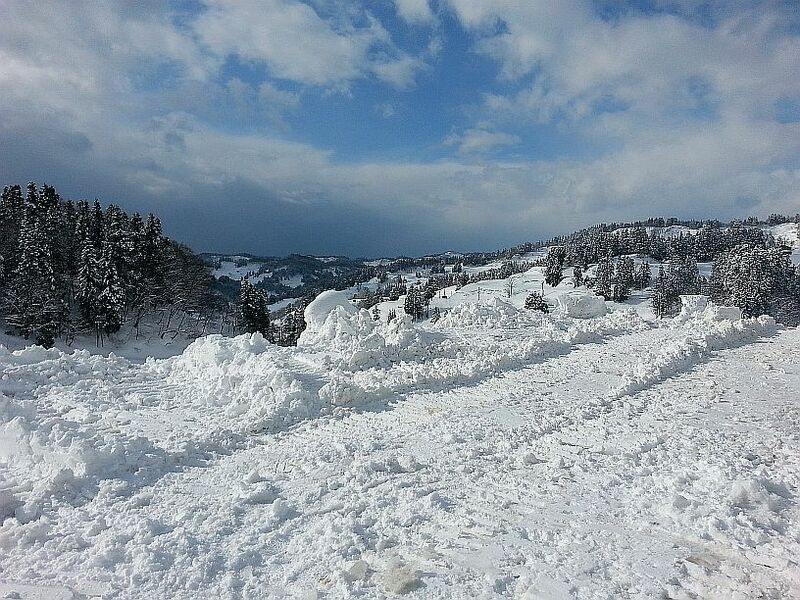 Blue sky and white snow - what a view! 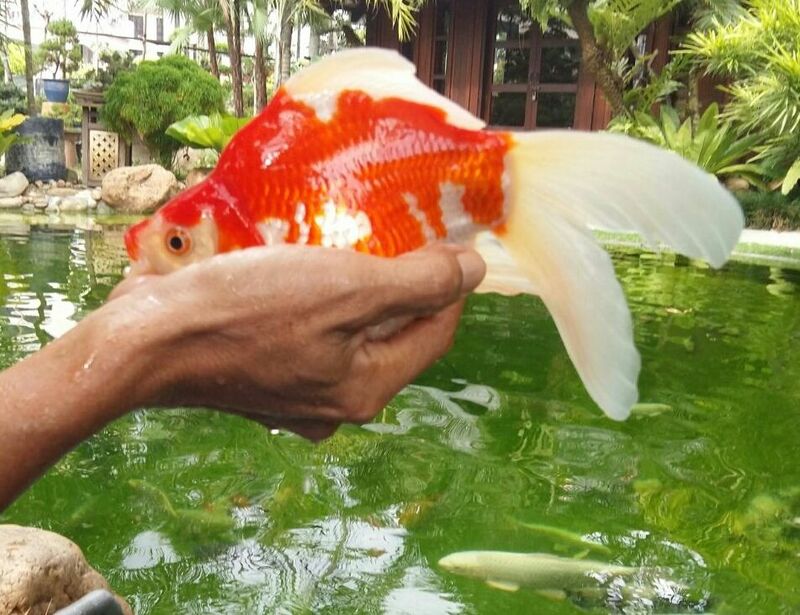 Koi purchased will be ready for sales from early February 2015. For pictures of some of the koi please go to Home page or Product page - Koi. Be sure to check them out! 1. Replaced cultured wall tiles to smooth finish wall tiles and installed decorative Bali stone blocks to brighten the look of the pond. Hacked off intermediate upper pond to create a bigger pond. water and harassed the koi! (3) It looks close to natural wood and does not rot. 3. 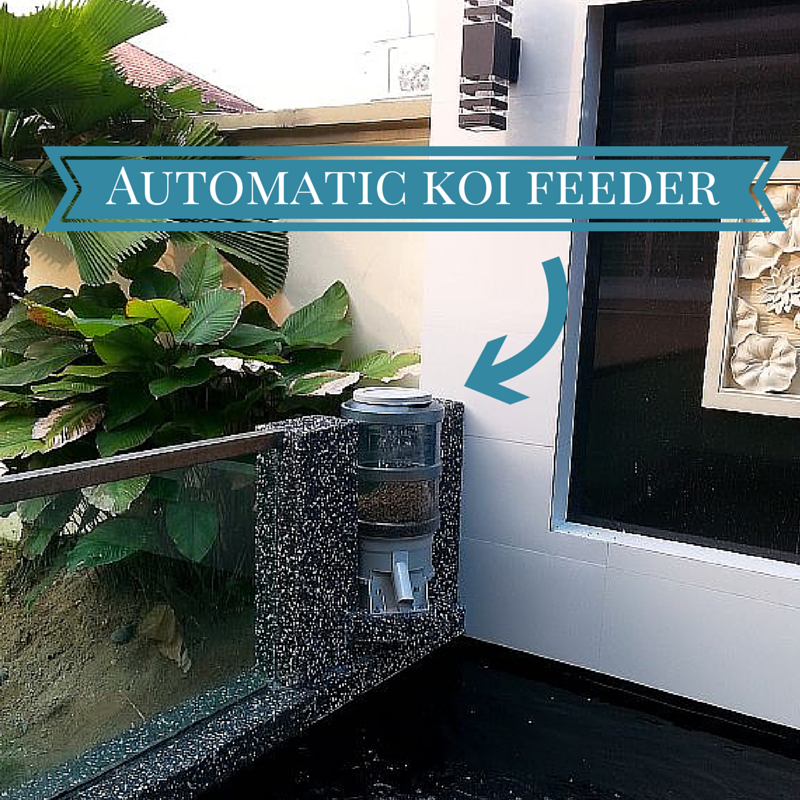 Installed Automatic koi food feeder. A reliable machine once the timer is set right and pre-tested before using it to feed your koi. You can set to feed your koi up to 6 times a day. 4. The completed pond with koi transferred back. 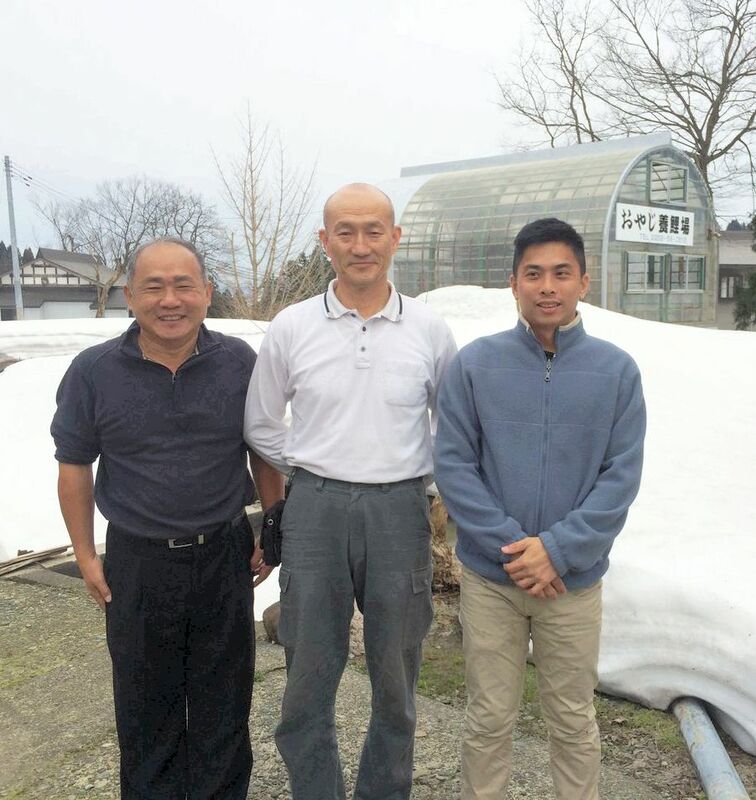 Upon arriving Niigata, we wasted no time and headed for several small farms in the Ojiya areas. High up on the hilly roads, snow was still melting away and it was really cold. 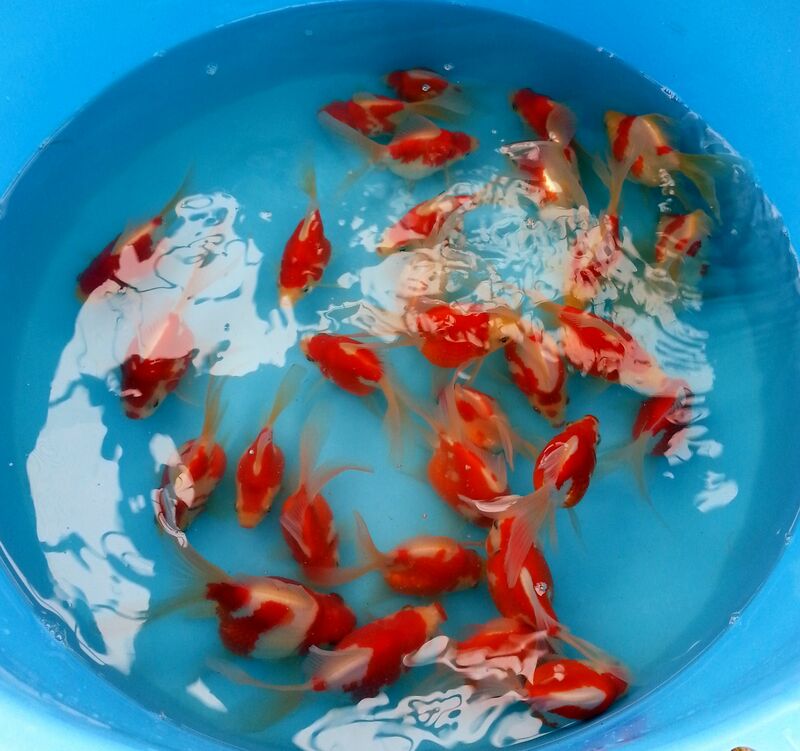 We were hunting for top quality Jumbo Tosai (one year old Koi) up to 35-40 cm which are normally available from April onwards as well as stocks of normal sized Tosai. Of course I also looked for good quality two years olds for our many interested customers and a few larger four years old of around 70 cm for another customer. Purchased Koi will be arriving at our outlet early morning 1 May. Viewing and purchase of these koi will only be available after quarantine. Pond completed and purchased Koi delivered Releasing Koi involving the whole family! 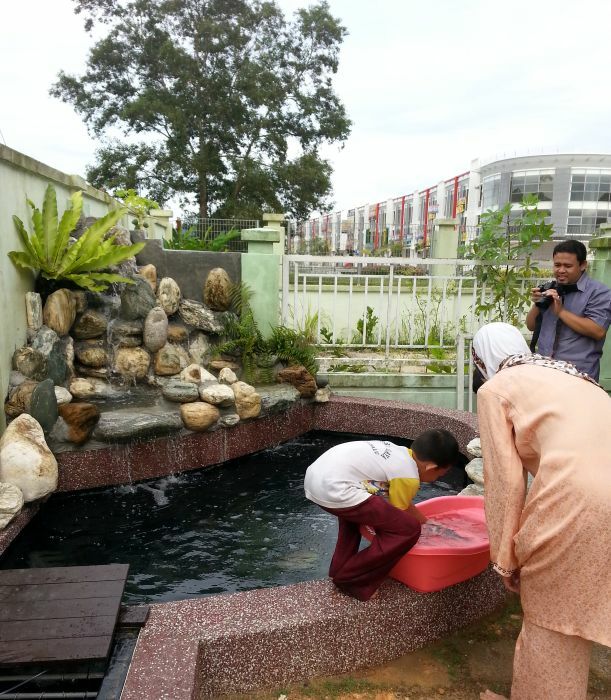 Dr Yusmanizah and wife got us to build their koi pond following exactly the design of our koi pond right in front of our outlet. 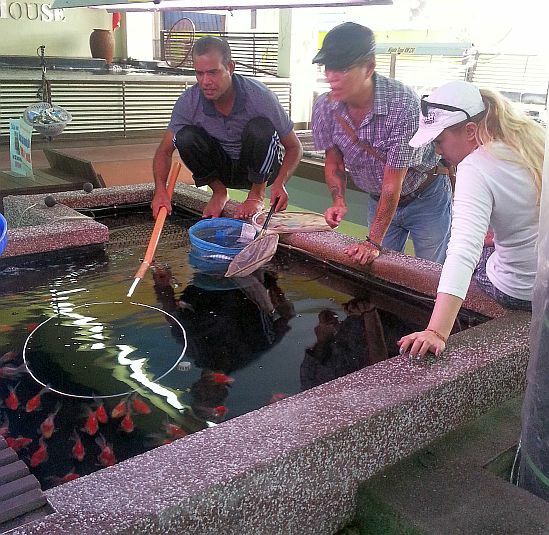 The pond was completed in 5 weeks and koi delivered to them and released to the pond on 29 November 2013. Another happy customer! 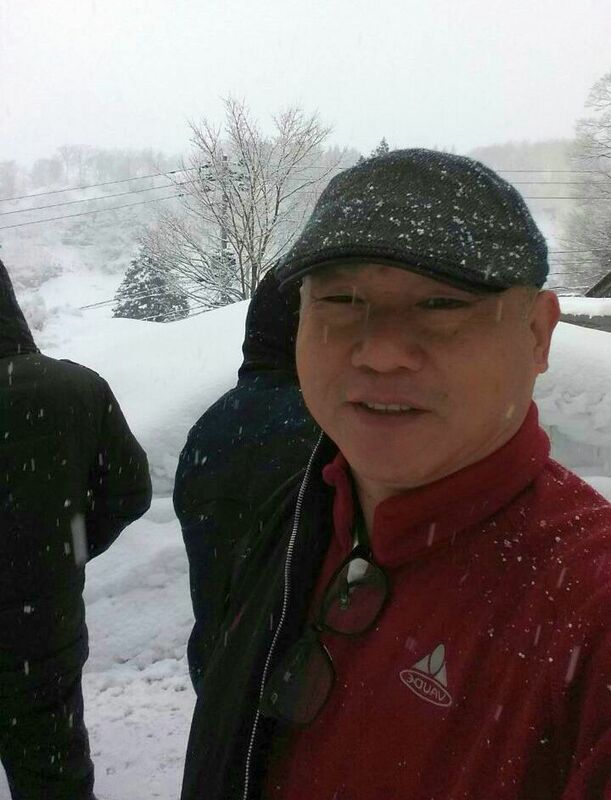 After ten long years, I revisited Niigata, Japan the birth place of Nishikigoi. 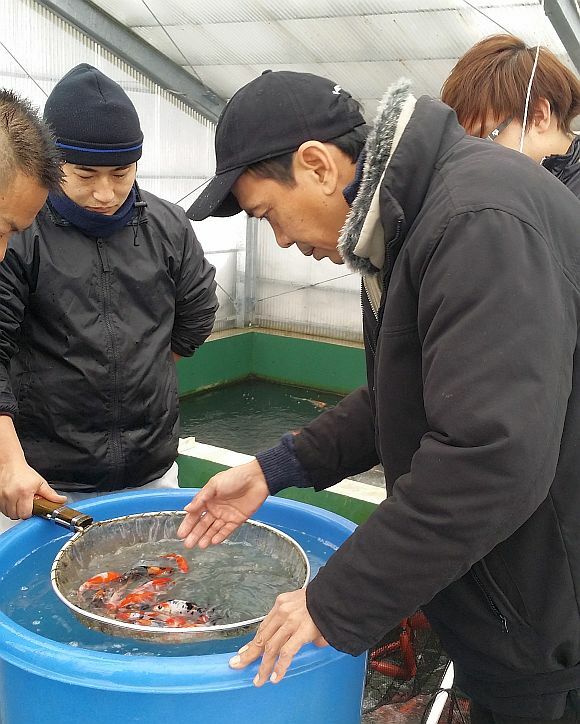 Over 5 days close to 20 koi farms visited and koi from 9 farms selected and purchased. They should arrive early November 2013. 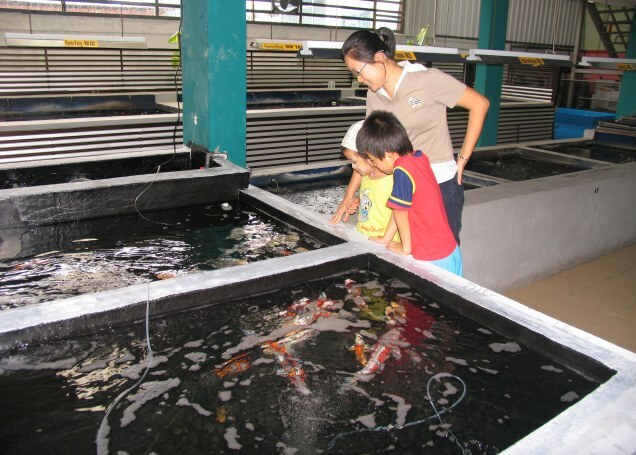 Koi picked range from this year's Tosai (baby koi spawned this year - 13 to 20 cm to 2 years old - 35 to 45 cm . A very good mix of varieties of Gosanke (Kohaku, Showa and Sanke) Tancho, Karashi, Benikoi (2 years old) and very nice Tosai Budo and Ai Koromo. 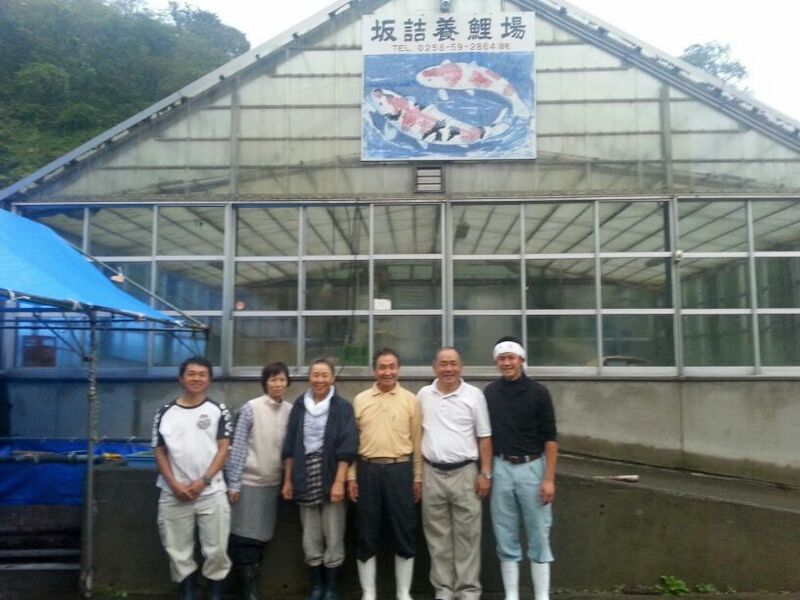 Koshiji Farm - the Champion of Doitsu koi Not selling if the price is not right! It was a very tiring koi buying trip but a fruitful one. The more farms and koi you get to see the better chance of buying koi that your customers love to have in their ponds. Do come and have a good look-see and select what you fancy. This is the place where this trip's very nice Koromo were purchased. 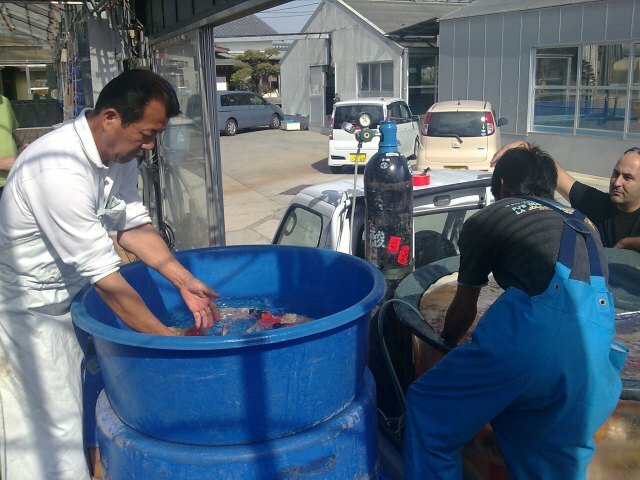 Mr Sakazume had just prepared his many tanks of Koromo to commence sale 2 days' time. We were lucky as we ended up having the first picks ahead of his many local and overseas customers! Submersible UV tube is an important accessory for Koi pond as it helps to get rid of 'algae bacteria' in water that cause water to turn green. UV tubes are designed to last for 10 months. Over the years sumbersible UV tubes purchased from local suppliers often fell short of expectations. The most frequent problem was the whole tube not working within few weeks. This was due to the breakdown of the PCB Board components when subjected to higher than the operating voltage of 220 to 240. Occasionally operating voltage could surge to as high as 260 and damage the PCB board. The manufacturer we are working with now has designed its PCB boards to withstand voltage of up to 260 volts. With this, hopefully customers with our latest submersible UV tubes will have less problems. 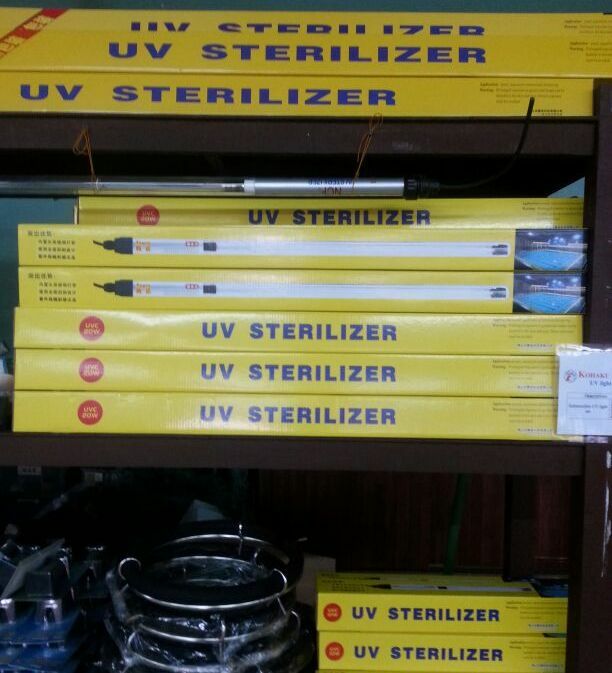 We now carry submersible UV tubes 10, 20, 30 and 40 watts. 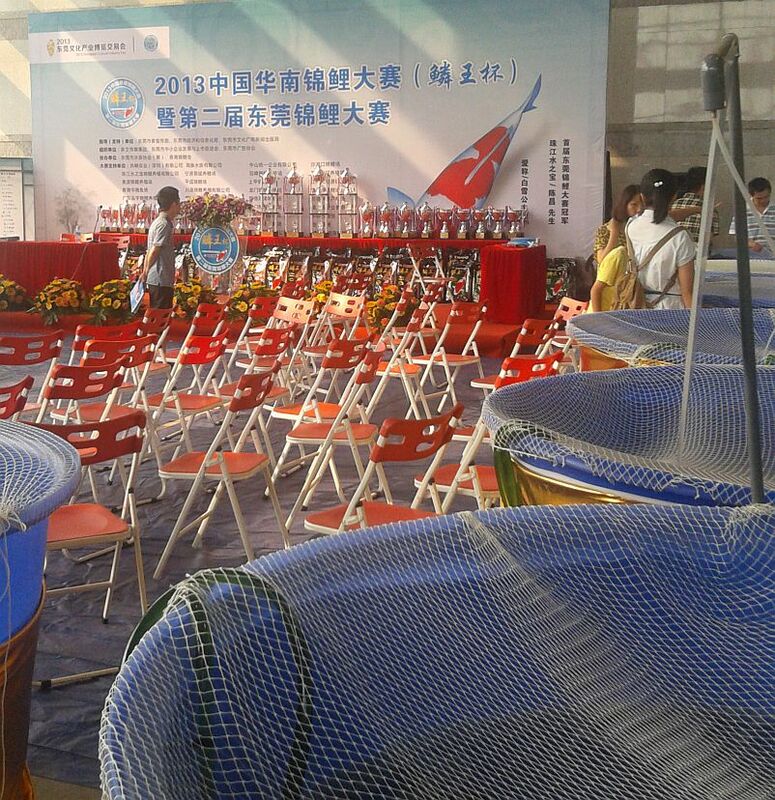 Visited Dongguan Koi Show 2013. 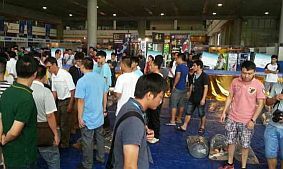 It was successfully organized with many koi related suppliers having booths at the Show. 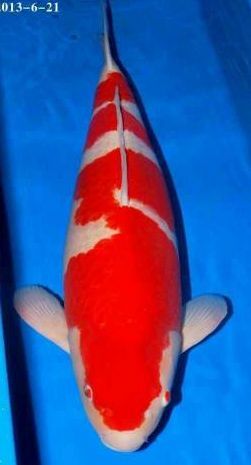 A Kohaku of size 88 cm came in as the Grand Champion of this year's Show. 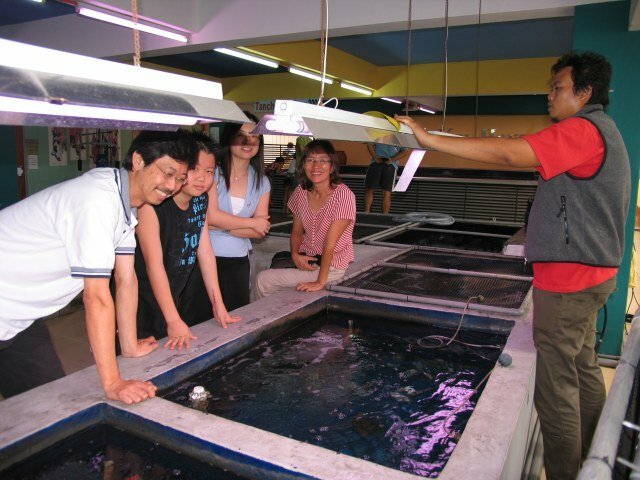 The main purpose of this trip is to look into sourcing better quality UV lights - a product that is necessary for koi ponds but in recent time have been facing frequent quality problems. Visited a reputable UV light maker in Quangzhou and will import from this factory UV lights (10 to 40 watts) of better quality and stablity. More details will be share in this website soon. We droved to Genting Highlands over the week-end (end of business day on Sunday, Monday our usual day off) and returned early Tuesday afternoon 9 July. We had a good time together! could not operate the outlet. Our sincere apology. Before our return, we took the opportunity to visit some koi retail outlets in KL to understand better their operation and also to pick up some good ideas for implementation at our outlet. After serveral weeks of preparation we finally go live with this new website on 1July 2013. More works still have to be done to make the website even more interesting and useful for our existing and potential customers. We will continue to work on improving and look forward to your support and feedback. Interesting.... they came for koi? Hey... they were not here to sell or deliver a new vehicle. 2291 could be a good number to bring you a win fall. 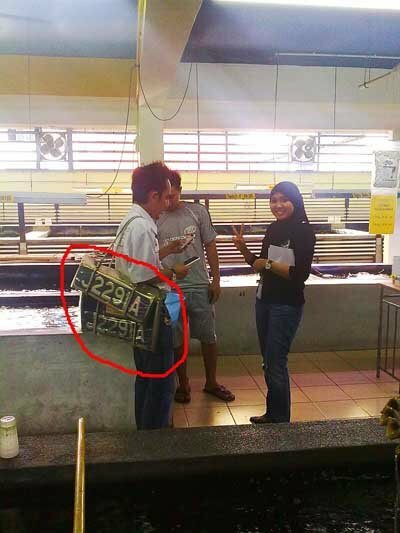 These people actually visited us to select koi and bring them back for their boss.... the man who owns very successful and popular car showrooms in Johor. Saying Hi to you in this picture is Chi Chi..... they all really love koi and never have enough of these nice, healthy and active fish. Thank you for your support. It was in late 2008 after visiting our customer's place in September that year that we decided to plant Passion fruits in front of our retail outlet. It took a little over 2 years for the plants to bear fruits..... many of them! They are over hanging our big banner which have pictures featuring our customers. Picture shows Mrs HL Ong and her children - it was from them that we got the first saplings and planted them. It is time of the year for Lunar New Year preparations. 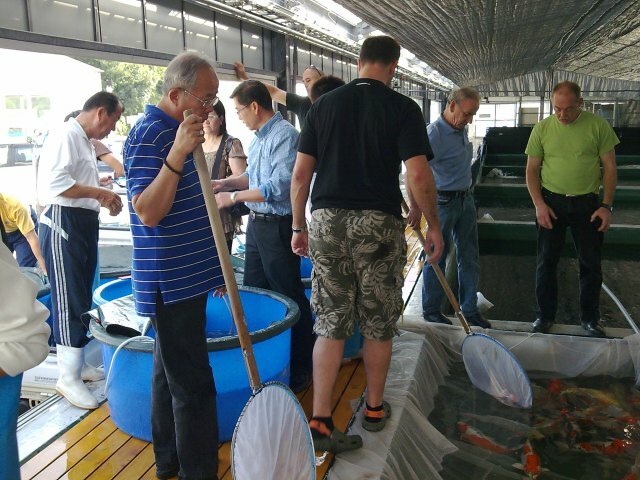 Customers are visiting us in pairs..... picture shows Mr Tan and his wife (right) from Taman Molek and Mr & Mrs Siow from Taman Kolam Air viewing and selecting Ogata baby koi which arrived 20 January 2011. Not in picture is Dr & Mrs Ashwin who came by around the same time to pick up plastic containers for storing koi food to keep them fresh. We have also completed out Lunar New Year decorations and mandarin oranges are also ready to wish all our customers Happy and Prosperous Lunar New Year 2011. 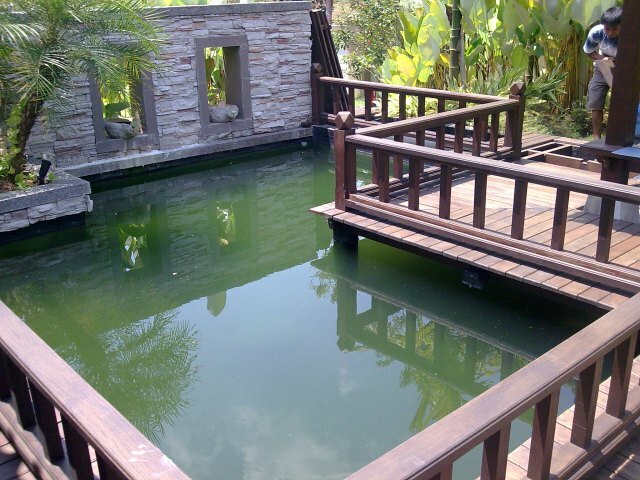 Above is a pond built without adequate filtration and totally without any water circulation jets or surface venturi. 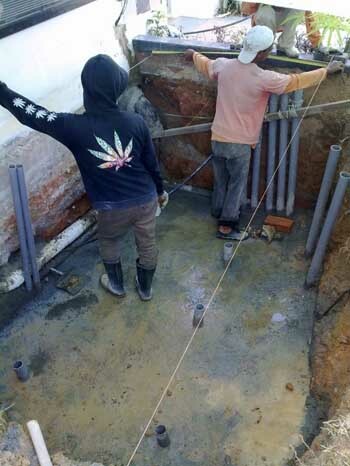 After having assessed the pond we designed and installed the piping system and built a filter (outside house compound) to effectively support the 10-ton pond. 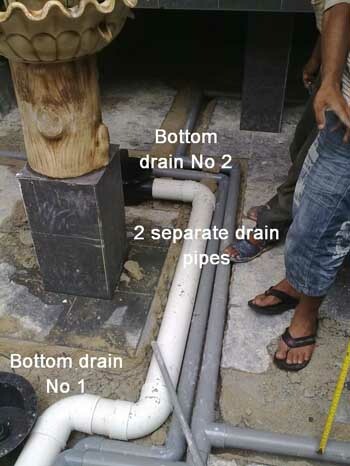 We prefer bottom drain pipes to be elbow-free, but for this one, given the already built structure hindering the way, we had no choice but to use elbows. 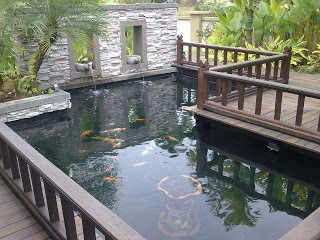 We have come across many koi ponds built without careful consideration for their filtration capability. As a result, pond water becomes 'green' and worst still the koi's waste not effectively moving to the filter and koi ended up living in a confined water pond with their own wastes! 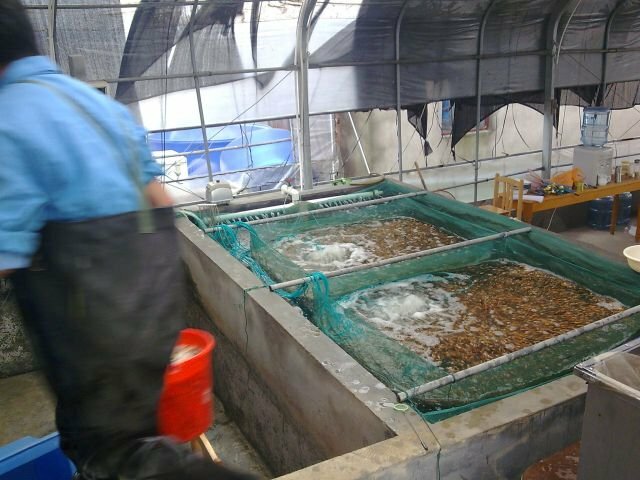 For koi to stay happy in a confined water pond, the basic idea is to have their wastes moved to a filter box (it's a pond's refuse bin) as effectively as possible. This is best done by a bottom drain. 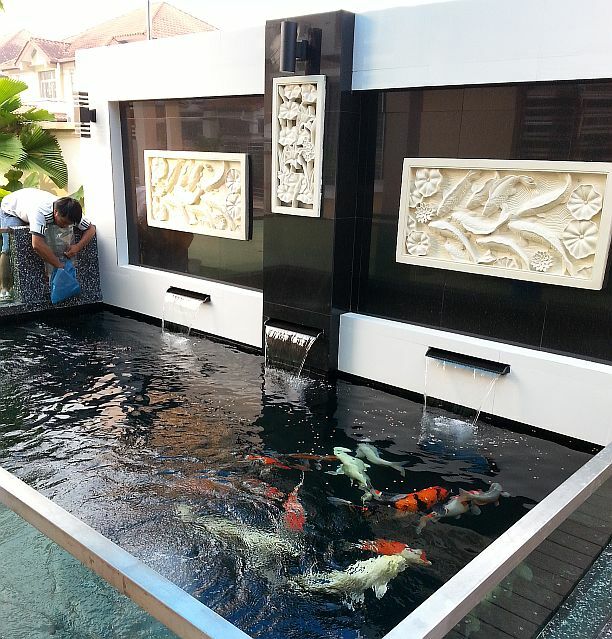 If you are not too happy with your koi pond, feel free to get in touch with us. Introduced by our Nusajaya customer Mr Dass to Mr Mohd Taib of Seri Alam whose 1 year old koi pond continued to have green water. 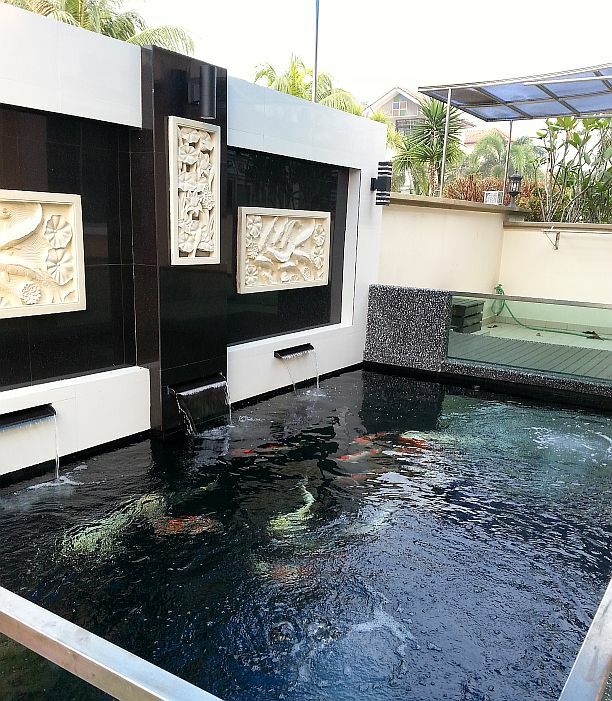 Mrs Mohd Taib was very upset for having spent the money engaging her landscape contractor to design and build the koi pond and not able to appreciate her koi due to green water. 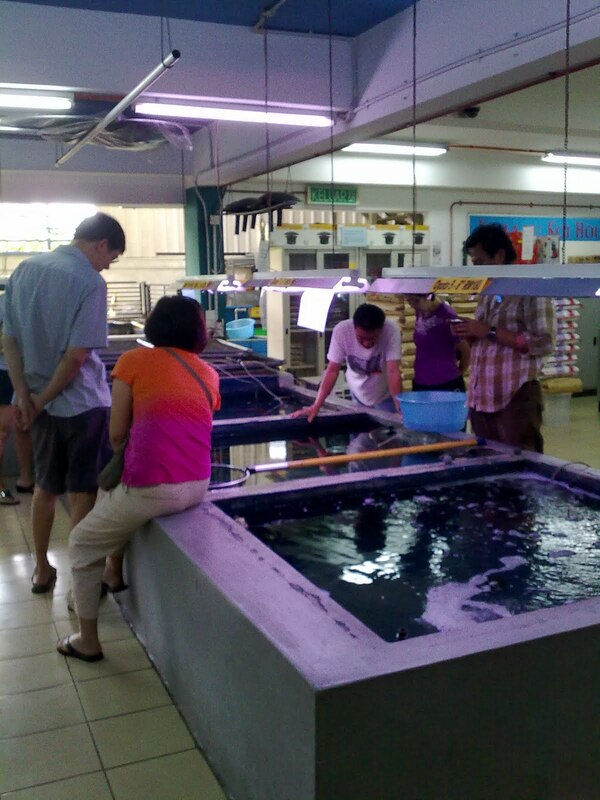 (1) Filter ratio to pond was at 25% (at least 5% short) and filter media in the chambers not adequate. (2) Water circulation not adequate as given the size and the water features built, having one water pump was slightly short. (4) Water surface skimmer not built to clear off surface debris contributed by the nearby plants and shrubs. Above shortcomings were corrected except filter size to create 30% ratio. 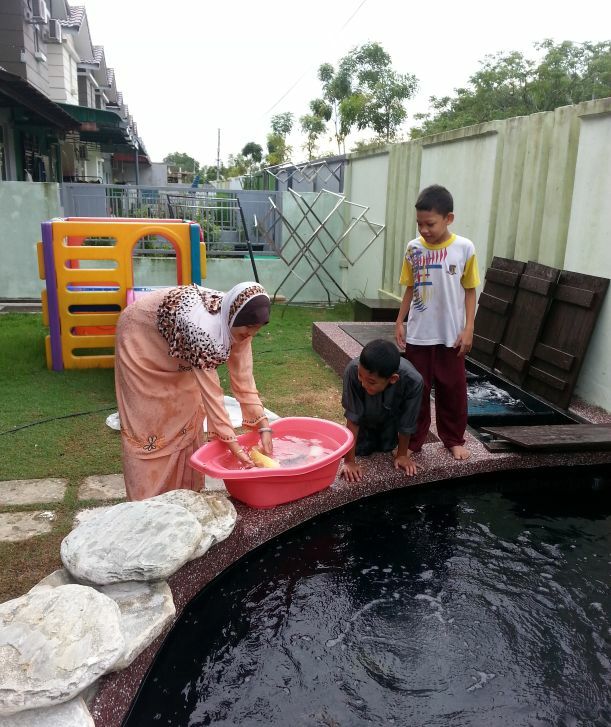 Pond water turned clear and koi are now in clear view and Mrs Mohd Taib became our very satisfied customer. Algae contributes to green water. Algae grows when (1) sunlight (2) nitrate (3) phosphate are present. So shading (Sunlight) of pond helps. Nitrate comes from the koi waste and when you over feed (and not having constant water drip as a standard practice for your pond) nitrate level is raised. However note that you have no control over Phosphate which is present in tap water. 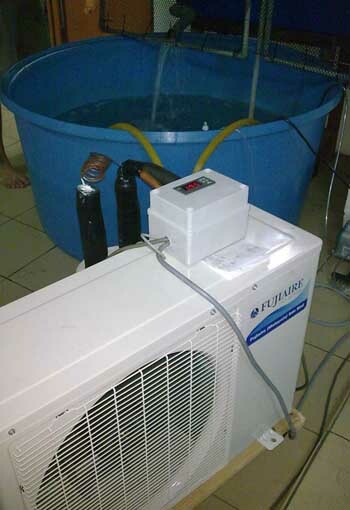 We need a big enough filter box of at least 30%, completely filled with filter media (filter brush, filter mat and coral) and have pond water continuously flowing through the filter media guided by the filter chamber partitions. Unnoticed by our naked eyes, the filter media's millions of bacteria 'clear' the water of algae including Ammonia and Nitrite which are harmful to your koi. Should you have green water problems, feel free to get in touch with us. 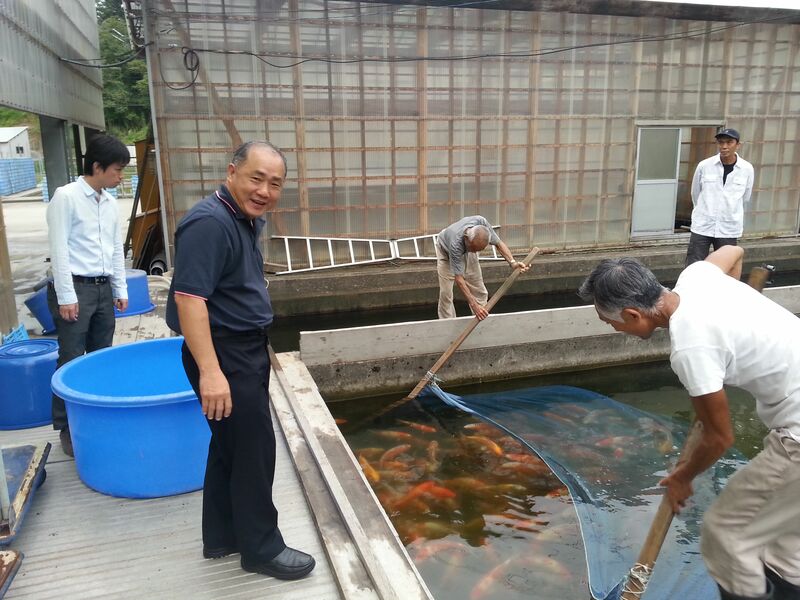 Mr Ogata getting ready the newly harvested koi transferring them to the various selection ponds. The many dealers from all over the world..... USA, Canada, Austria, Switzerland, Indonesia and others with Mr Ogata's elder brother selecting on behalf of some European customers. Keen eyes and quick judgements are necessary to pick the best for our customers back home. The strongest still not giving up..... you never know, a sought-after variety could still be around. 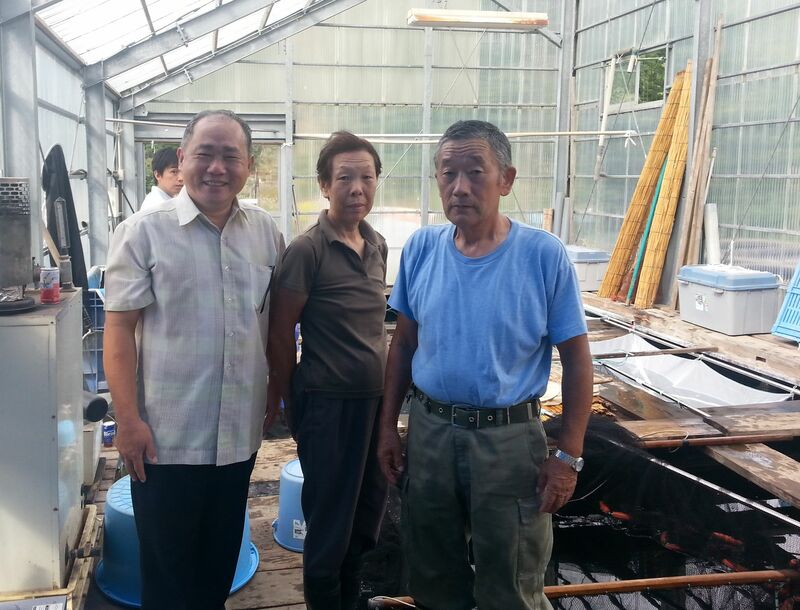 Visited customer Mr Ibrahim who has several koi ponds within his very big bangalow. 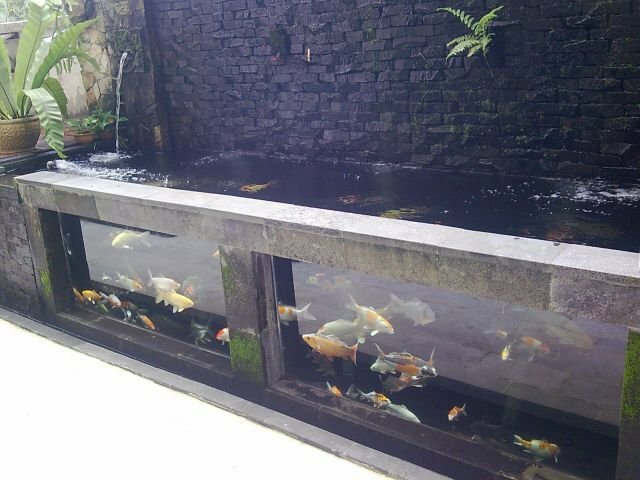 One of the koi ponds is with glass panel (picture above) where he keeps his medium-sized koi. Very good collection of koi indeed! 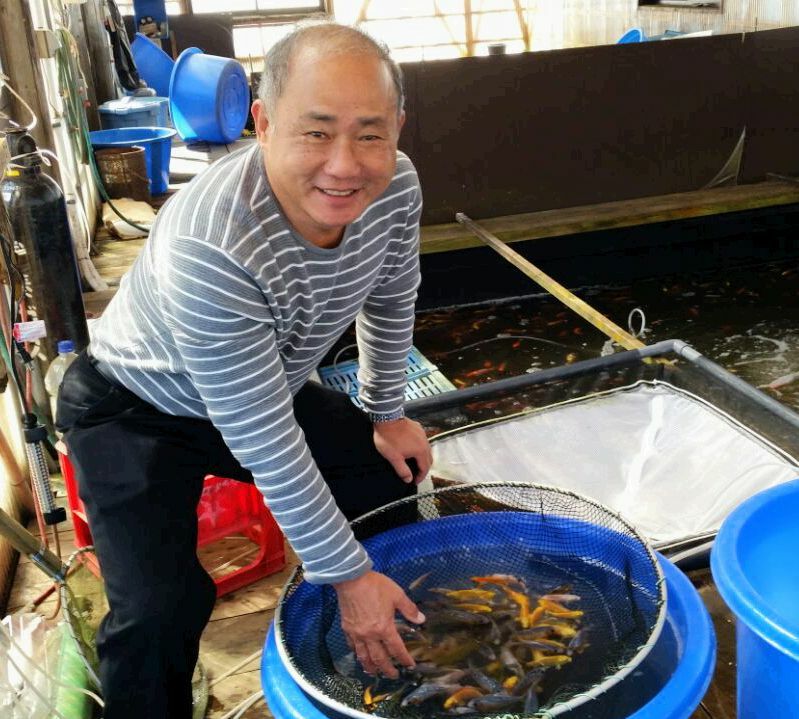 Mr Ibrahim prefers to buy many koi at one go and only after keeping them for several months he would then determine where a particular koi would end up - either his 5 feet main pond (20-ton) or this 10-ton glass tank with proper filter system. The best koi collection in a glass tank I have seen so far..... Congratulations to Mr Ibrahim. 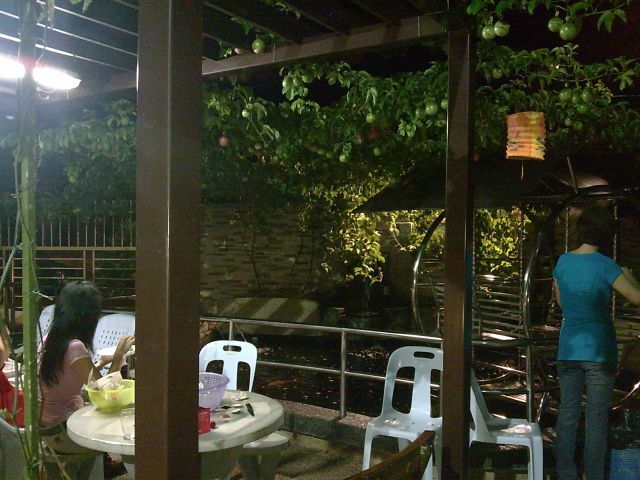 Can you see passion fruits hanging from the plants above the koi pond? Visited Mr HL Ong's house (scroll down to refer to post dated 10 December 2007) for mid-autumn festival and was amazed by his great effort caring for his koi collection! Simply fantastic - his biggest piece has grown to easily 60 cm from about 35 cm bought a year ago. To provide shade for his koi he has planted Passion fruit - a great idea and a first, I think. This adds a touch of class to the whole pond with passion fruits hanging from the plant above the koi pond. Kohaku Koi House today enbarks on a similar initiative to commence planting passion fruit plants at our outlet with the intention to bring this idea to other customers. Above picture shows the 6 koi. Below the plastic bags, ice pack on the right. 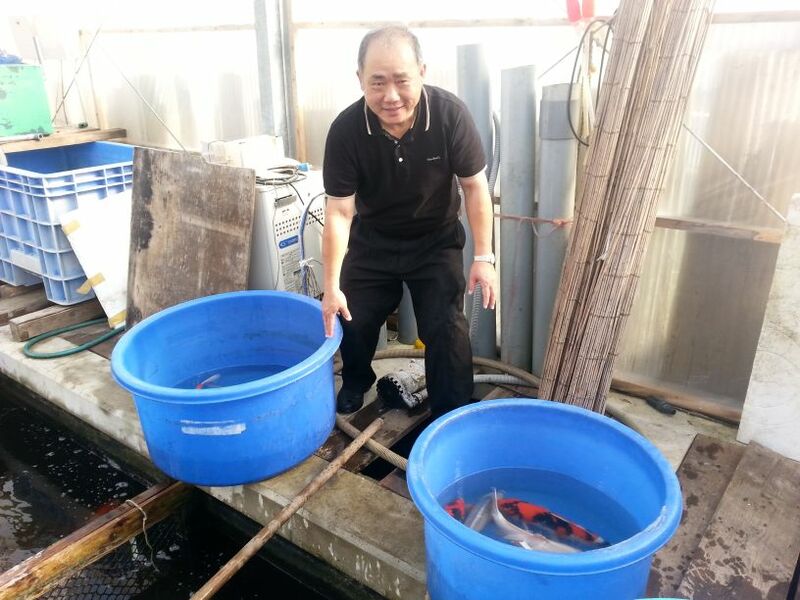 After several weeks, Mr Jacky Chan of Bintulu, Sarawak received his koi; happy, excited and a satisfied customer. My Koi arrived a bit late this afternoon at 2:00pm (15 minutes delay) but it is worth to wait for my quality Koi. 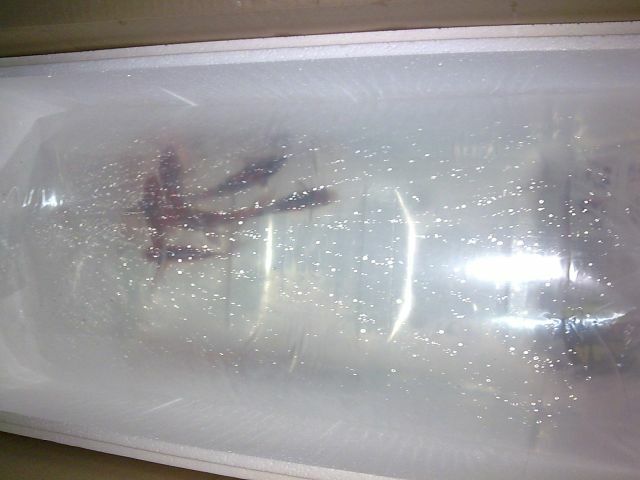 Upon arriving home, I quickly open up the well-packed box with Chiller to lower down the temperature (over at KK House, we use a chiller to bring down water temperature to 20 degree C) all six Koi look healthy and swimming swiftly in my eyes. It is a new lesson to me too that Koi colour will fade after it was frightened or felt uneasy, especially its black patches on black-based Koi namely, Showa and Utsuri. Thanks God, all colour re-emerged to solid Sumi (black) after some 3-4 hours' rest in my pond. Wow!!!! I finally got my dream Hi-Utsuri, Showa, Shusui, Doitsu Sanke and Goshiki. Again, I extend my utmost appreciation to you, Mr. Ong. Please find the attached photos for more detail, I purposely took them for record for both of us. I have no objection too if you would like to publish the 3rd picture in your blog, after all, I thank you for introduce all six Koi to me patiently and promptly via email, as well as phone communication. 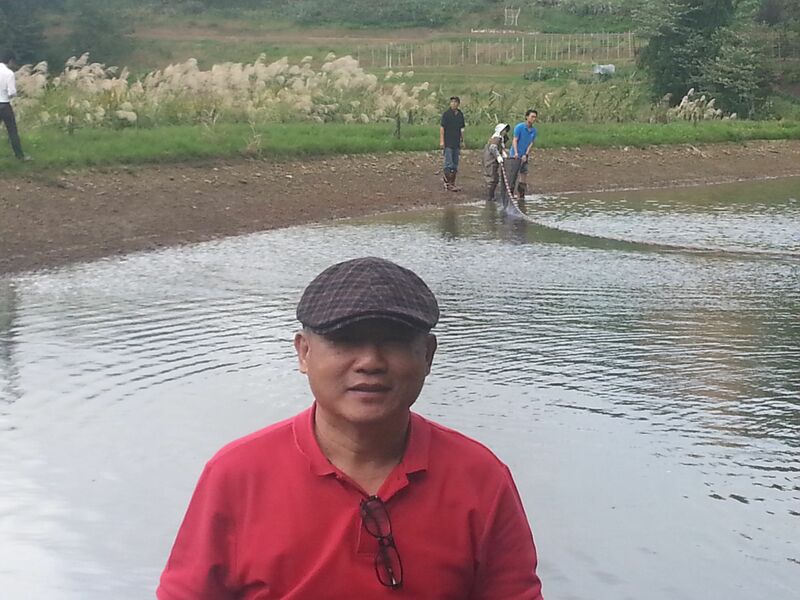 I guess one of these days I should fly over to Johor to pay a visit to your farm. 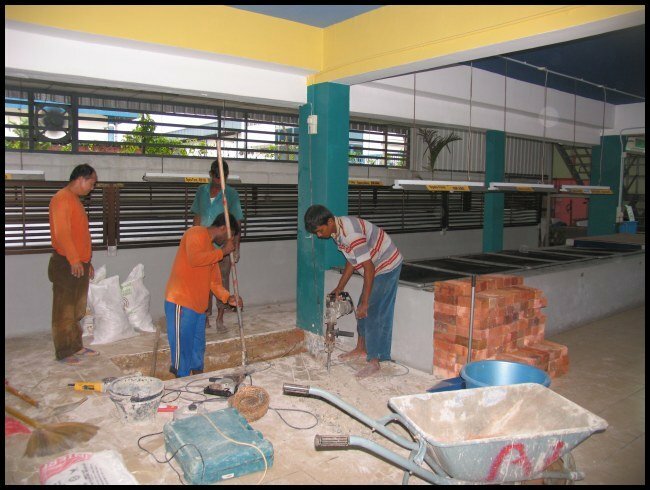 It is a start but not end, for Koi hobbyists here in Bintulu. Well Mr Chan, I have said in my reply to your email that I am glad for you. I would also like to thank you for your support, you had been such a pleasant customer! Picture shows getting fries ready for culling by experienced staff of the farm. 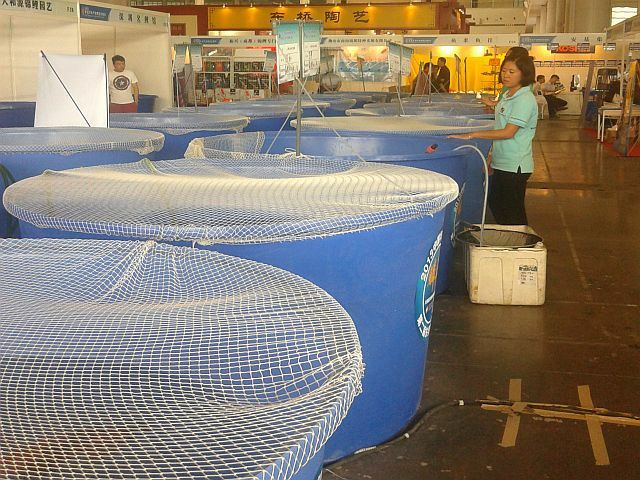 It's the busier time for a koi farm when culling starts. 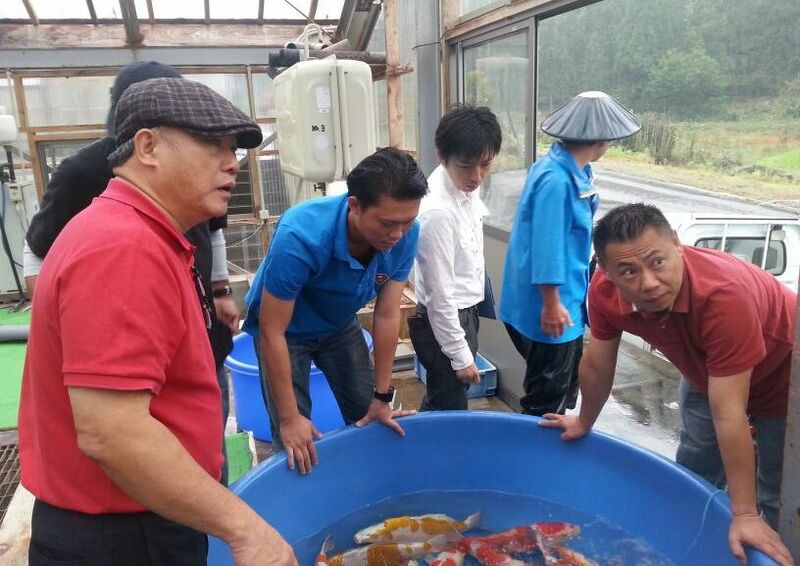 Koi from Wuxi farm has been selling very well locally due to its high quality and the huge domestic market. It is not unusual for a customer to travel for 10 over hours by train to pick up Koi from the farm! 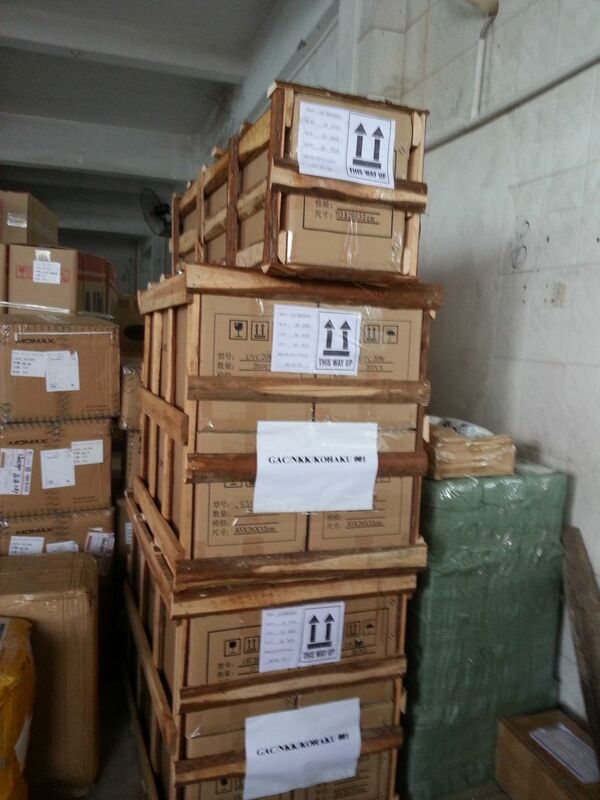 We only air freight Wuxi Koi to Malaysia for competition (China domestic demand for Koi is very huge!) and to-date only one Malaysian customer has the privilege of raising Wuxi koi as he ordered them from Wuxi direct via it's website www.wxkoi.com. 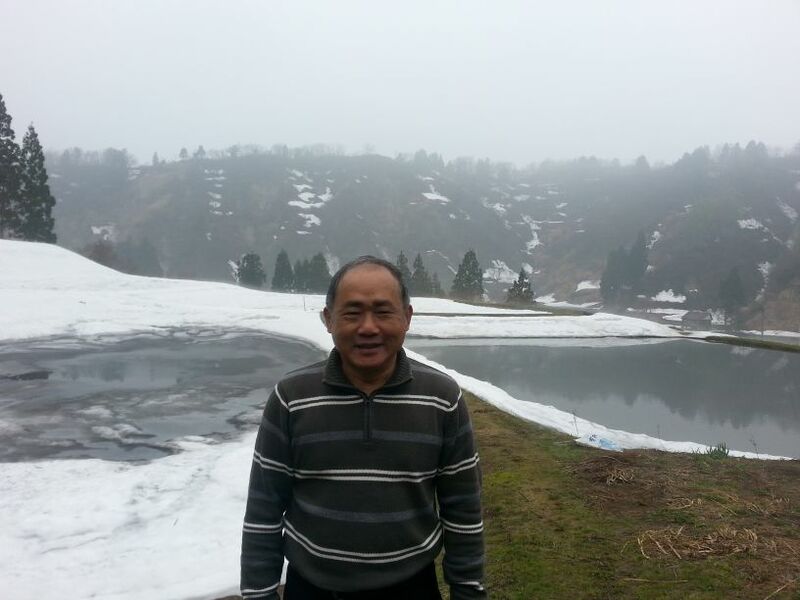 He is Mr AC Ng of Xin Hwa trading & transport. Log on to www.wxkoi.com for better understanding of our Wuxi farm. 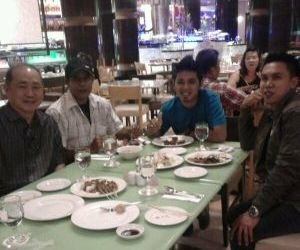 Got an enquiry from Mr Jacky Chan who asked about an Aka utsuri or Hi utsuri which he spotted in one of our pictures posted on slide.com or this blog site. Unfortunately this piece was sold off together with a Shiro utsuri some 3 weeks ago. We will soon be sending a picture of another beautiful Hi utsuri via email. 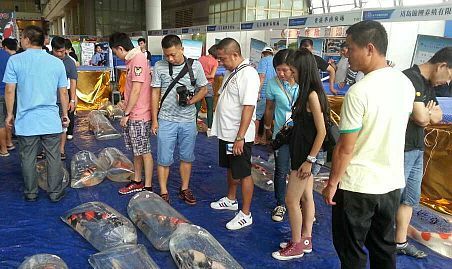 He will also be informed on how he could get koi direct from us at a very affordable fee (air freight and import/export permits, etc together with other buyers from Sarawak) as we have regular koi retailers from Sarawak buying koi from us. A very well organized and big farm. A farm with huge natural ponds (total 7 nos.) 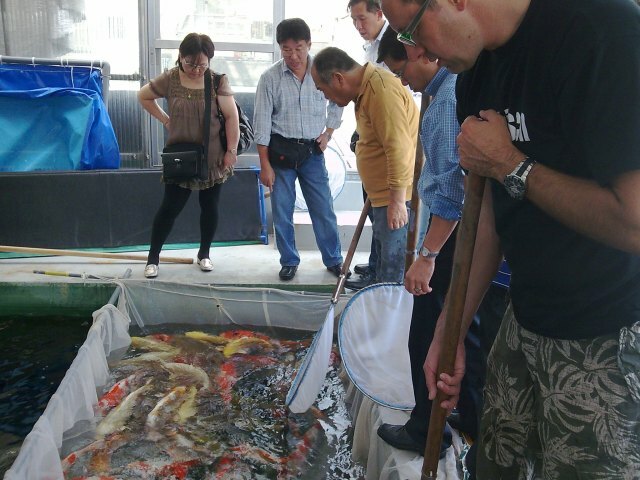 to nurture very good koi for the world market. These natural ponds are scattered about in different locations and about 1 hour's drive away. Before harvest of these koi, 10 days are needed to drain off the pond water! 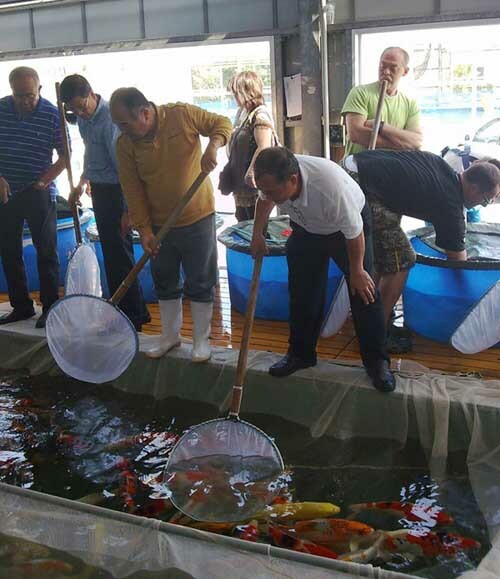 Inspected easily 4000 koi and selected about 110 pcs of 8 to 14 inches. These will be shipped over on 8 May and we will commence selling them from 13 May after 5 days' quarantine. You have to visit us to see for yourself the hand-picked Koi from Ogata Farm. Have been selling Ogata koi for a long time but visiting it for the first time end April! I didn't know Fukuoka is actually on Kyushu island and not on Honshu. I recall the good old days of Yaohan supermarket promoting fruits from Fukuoka city, Japan. 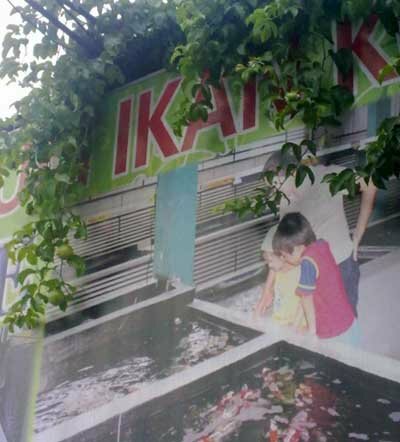 It was Renny, my pond and koi customer from Seri Alam who got the location of this place from the internet. Renny will be travelling with me for his very first visit to a Japan koi farm! Happy Lunar New Year. 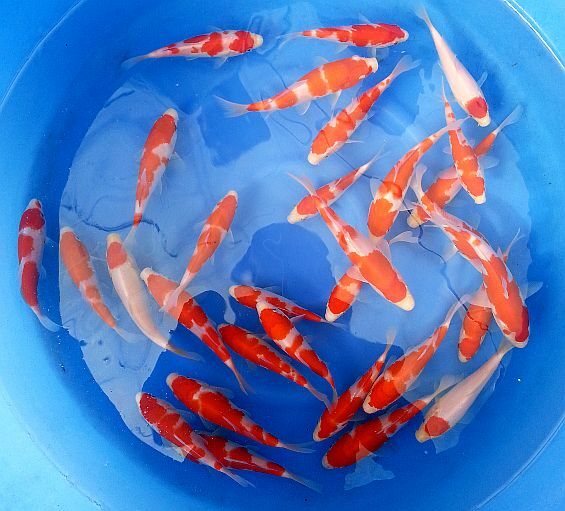 More Ogata koi waiting for your selection. We reopen for business on Sunday with our advertisement on Sin Chew (Saturday) featuring the latest completed pond. We look forward to welcome you to our retail outlet. We have just received about 300 baby koi from Ogata farm in time for you to add to your koi collection for the coming Chinese New Year. As usual, we will need 3 days to allow for quarantine. 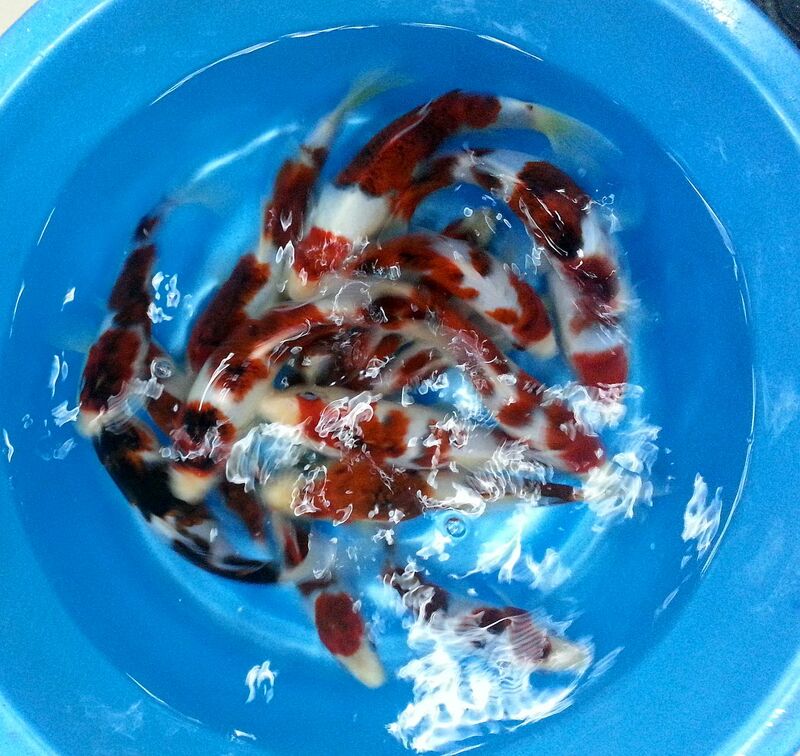 These baby koi will be ready for your selection on Saturday, 26 January. The usual in-house discount policy applies. We look forward to welcome you! For the last few months we have HL and his family visiting us regularly and adding koi to their new koi pond after each visit. This morning, the son, whose name with initial CK spotted a Sanke with the letters CK across the body and decided to add this koi to their collection. The daughter picked a 14" friendly yellow kawarimono from our newly completed koi ponds. 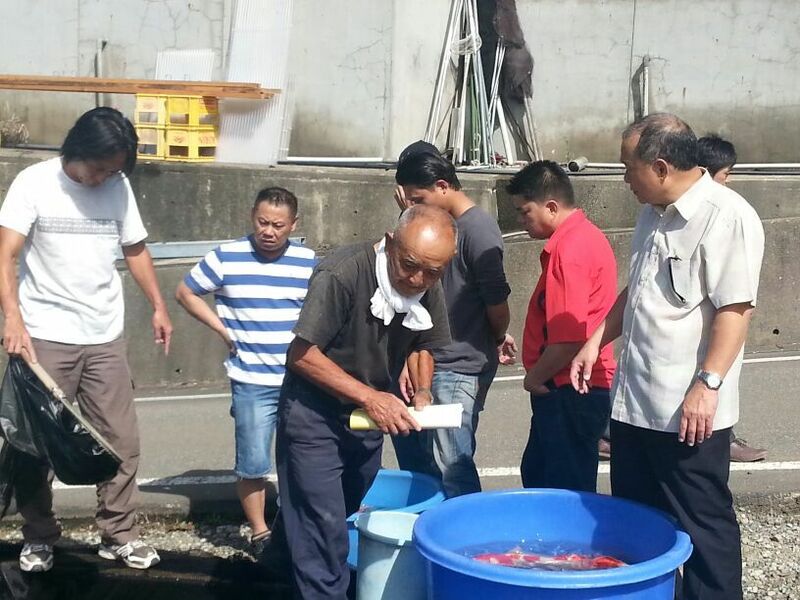 Pictures show Mr HL Ong and family viewing and selecting koi. HL also purchased a salt tester which is useful to ensure salinity level is maintained at between 0.1 - 0.2%. 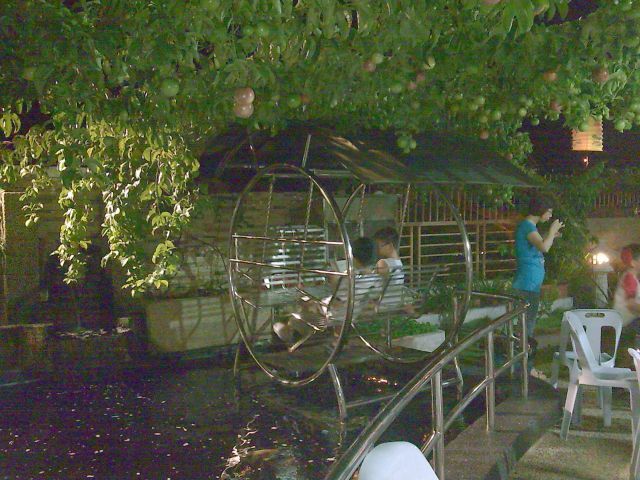 HL's koi pond has a swing above the pond which makes viewing of koi particularly enjoyable! 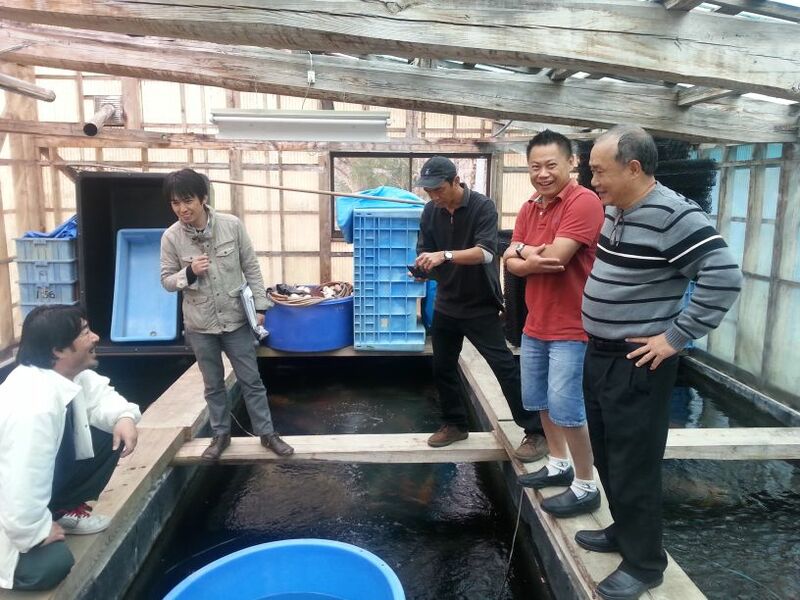 Above picture shows Mr Chew and his family members, all smile after selecting one Omosako Shiro Utsuri and a Ki-Showa. Mr Chew became the 3rd customer to make booking for our new arrivals. 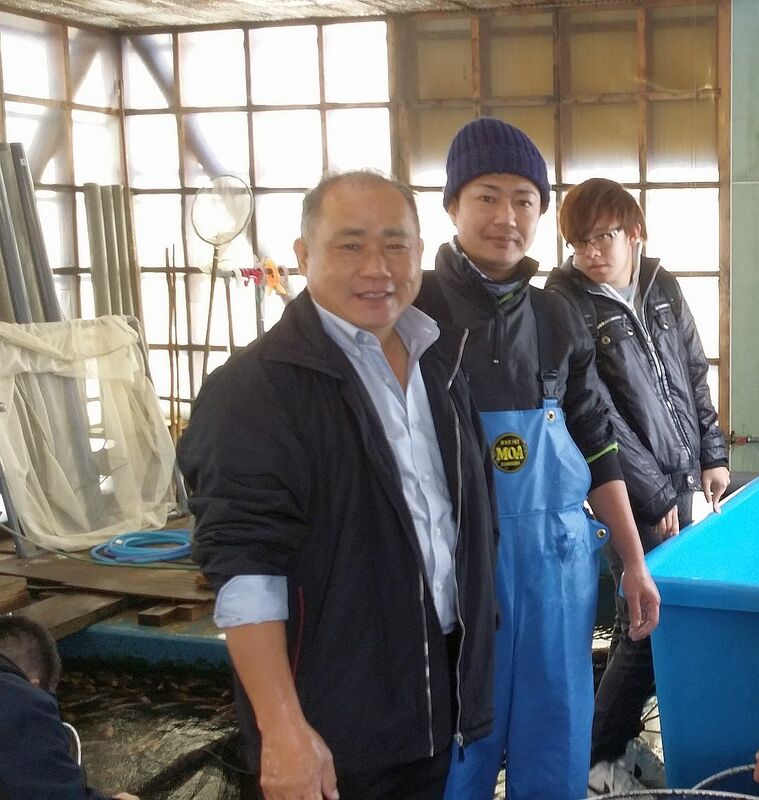 A Mr Shak has booked 2 Izumiya Yamabuki Ogon and Mr Fong has purchased several Platinum. 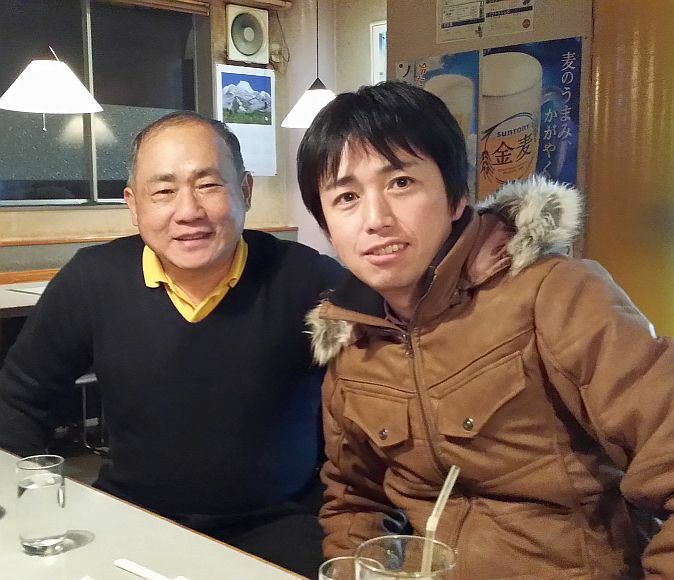 Our strong supporter, Mr David Kee also purchased one Omosako Shiro and 2 Otsuka Hi Asagi. We thank you for your support and look forward to you picking up your new purchases next week! We are adding more ponds to the outlet. Two small 1-ton ponds (picture above) and a much bigger 18-ton pond will be added. Construction for the two small ponds started today and is expected to complete within the next 5 days. 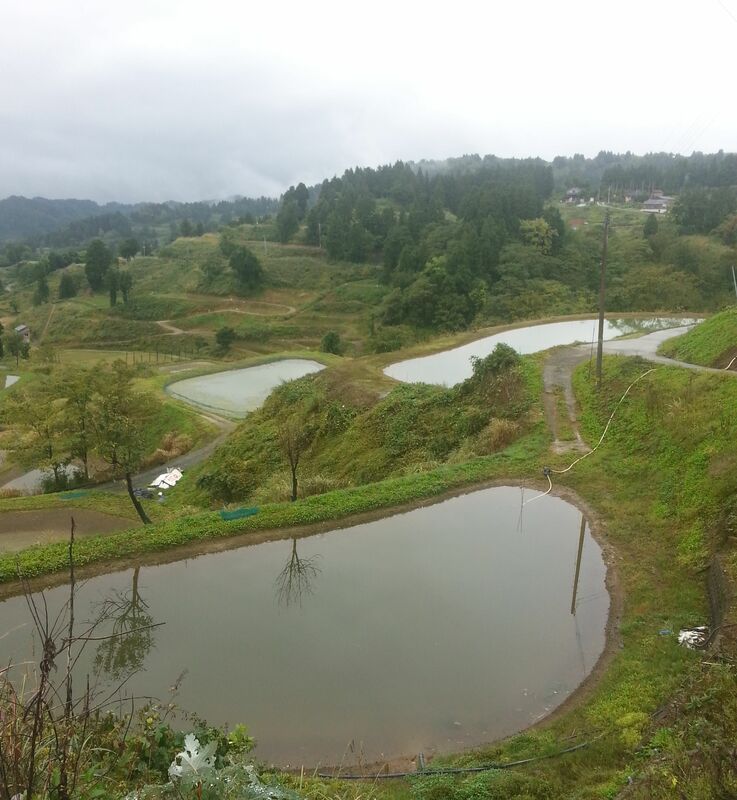 The 18-ton pond, with intention to double up as a Show pond for potential customers planning to make ponds; is expected to be ready come 3rd week of November. Will bring you more details as we progress along. We have just received our new stock from Japan. 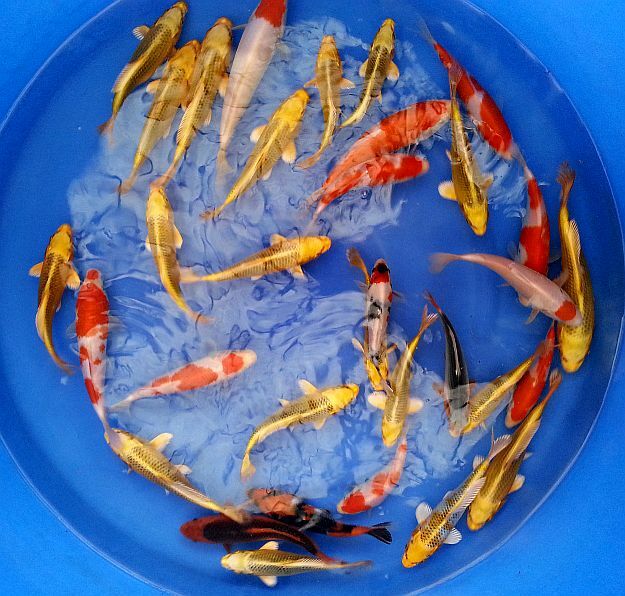 These koi are available for viewing at our retail outlet. Pictures of them are already posted. Sales will commence next Tuesday but you are able to make your bookings right away. If you are prepared to quarantine them yourself, it is possible for you to buy them right away. We make it simple for you. Our in-house discount policy applies to new arrivals too! We look forward to welcome you.